We Made a Horror Movie! – Thread Design – Branding, Brand Strategy, Website Design. Shanghai, China. We Made a Horror Movie! Why we made it and what was our process? Hiking seemed like a good idea, but how to make it more interesting. Upon planning the trip we realised it would fall just before Halloween, and so, inspired by a Taobao search for fancy dress, the dinosaur concept was born. Then what? Ten people, three inflatable dinosaur suits and hiking to the most remote village in Eastern China (yes it’s two hours walk from the nearest road). Let’s make a movie? A horror movie. Story Board. meh, we’ll make it up on the bus! Once we got there we only had a few hours to film, what with hiking, eating and a very long bus ride, making a movie was crammed into a short amount of time. With almost no planning and just a vague story line in mind we decided that making up as we went along would be the best approach. In hind sight, it wasn’t, it’s a terrible idea. I would imagine that Spielberg didn’t approach any of his movies this way. Perhaps he should. Upon returning to Shanghai we decided to make a movie poster instead of a movie. Posted it on Wechat and the hype began, the pressure was on to deliver. It was obviously going to be awful, so how do you make something awful amazing? Firstly, the amazing Jennifer. 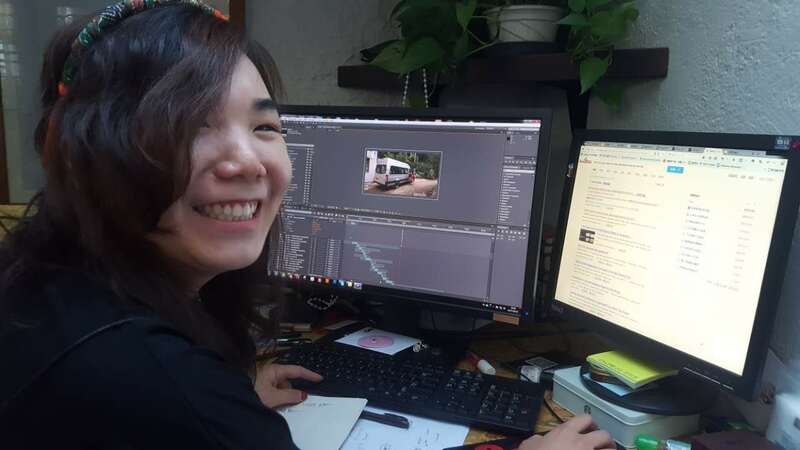 Jennifer is our Digital Art Director, she’s not a movie editor, she’s never edited a movie, but that doesn’t matter right? how hard can it be? After a few days of editing, we had a storyline, but the movie was still bad, really bad. Ten minutes long and nonsensical, time to make some really tough decisions and cut a ton of acting, dialogue, ridiculous dinosaur stuff and make it something watchable. We got it down to four minutes. Getting better. However, it was still missing something. Introducing dear friend, client, and world-class sound designer, Peregrine Andrews who runs Moving Air studio in London. Peregrine sound designs for the BBC, he knows a thing or two. He built us a phenomenal soundtrack to bring our movie to life. The difference is night and day. This is what sound looks like. From here, a few colour filters, some special effects, intro animation and ending credits. Add in a cheerleader dancing and we have our movie…. We hope you enjoyed it and it made you laugh… more than once. Below are a collection of behind the scenes shots. The whole team on the hike up, sadly minus two pregnant girls and one sick one. The village. Pretty amazing place. Highly recommended. Rita and the Dinosaurs in the square. Manaf getting ready for his fight with Justine. Our Jock just chilling out. Harry drinking beer with the dinosaur. note the fake arm. High up. Very High up. Yes that’s a 100 meter drop behind us. The Hike back to the bus. C . H . R . I . S . T . I . N . A . CHRISTINA! 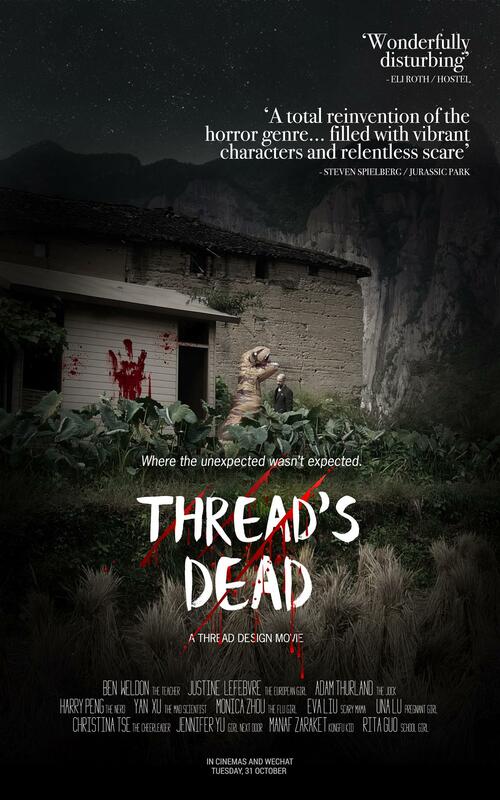 I personally want to say a MASSIVE thank you to all the members of the Thread team who were up for doing something this silly and allowing me the time and resources to indulge in some unpaid creative. It makes the hard work so much more worthwhile. Next year, a Bond movie set in Thailand?